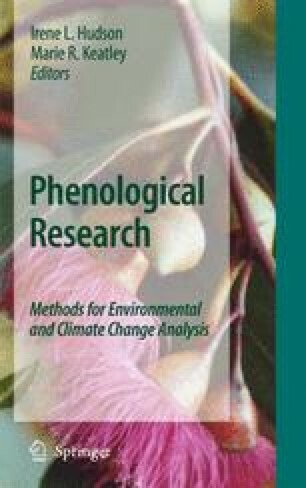 This chapter represents one of the first attempts to utilize phenological data to detect non-linear responses of flowering to climate change using GAMLSS. We use the flowering of four species (Eucalyptus leucoxylon, E. microcarpa, E. polyanthemos and E. tricarpa) as a case study. Regardless of cyclicity of flowering over time, this study shows that each species flowering is significantly influenced by temperature and this effect is non-linear. Stepwise GAMLSS showed that the main temperature driver of E. leucoxylon is minimum temperature (P<0.0001), maximum temperature for E. polyanthemos (P<0.0001), both minimum and maximum temperature (P<0.0001) for E. tricarpa, and mean temperature for E. microcarpa (P<0.0001). Rainfall was not a significant predictor of flowering. GAMLSS allowed for identification of upper/lower thresholds of temperature for flowering commencement/cessation; for the estimation of long and short-term non-linear effects of climate, and the identification of lagged cyclic effects of previous flowering. Flowering intensity of all species was positively and significantly correlated with last month’s flowering (P<0.0001); and with flowering 12 months earlier for E. polyanthemos and E. microcarpa. Flowering of E. polyanthemos was negatively and significantly correlated with flowering intensity 2 and 4 months prior; in the case of E. microcarpa with flowering 6 and 8 months earlier. Overall, E. microcarpa and E. polyanthemos flower more intensely in response to predicted increases in mean and maximum temperature, respectively. E. leucoxylon flowers less intensely with predicted increases in minimum temperature; E. tricarpa flowers less intensely with increased maximum temperature, but more intensely with increased minimum temperature (after accounting for maximum temperature).